Avant-garde metal has been called the most difficult Heavy Metal genre to define and describe. It is characterized by the use of innovative, avant-garde elements, large-scale experimentation and the use of non-standard and unconventional sounds, instruments, song structures, playing styles and vocal techniques. The term “Avant-Garde Metal” is also often used as a term for the separate genre of “Atmospheric Metal” or “Post-Metal”, which was named in reference to post-Rock. Avant-Garde Metal is related to Progressive Metal, but Avant-Garde Metal often has more experimentation, while Progressive Metal usually has a tighter focus on Traditional Metal instrumentation and higher levels of technical complexity. Avant-Garde Metal also uses unusual sounds, breaks conventions and often includes new elements. The lyrics and visual presentation of the genre are eclectic as well. According to Jeff Wagner in Mean Deviation, electronic percussion and drum machines see widespread use by Avant-Garde Metal bands, along with female vocals and operatic elements, all of which he attributes to the influence of the band Celtic Frost. The Canadian group Voivod also influenced future bands in the genre, pioneering technique such as robotic vocal effects, unusual time signatures and fractured, dissonant, unorthodox guitar sounds. According to Ian Christe, Avant-Garde Metal emerged from Death Metal as a number of musicians “abandoned the tightly wound structure of the music and experimented with abstractions of its founding elements.” Progressive Rock has also been cited as an influence. Some early examples are the King Crimson releases Larks’ Tongues in Aspic and Red in 1973 and 1974 respectively, with the latter album’s title track defining an “Avant-Metal style” that Robert Fripp would revisit years later. Another early example is the 1976 Led Zeppelin album Presence. The genre emerged in the early 1980s through the efforts of bands such as Celtic Frost and Voivod, who pioneered the genre. 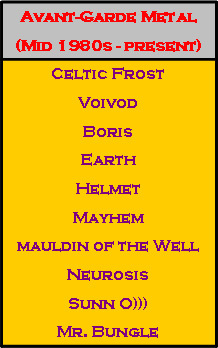 Other pioneers of Avant-Garde Metal include Boris, Earth, Helmet, Mayhem, maudlin of the Well, Neurosis, Sunn O))) and Mr. Bungle. In the late 1990s, Misanthropy Records emerged as a promoter of Norwegian Avant-Garde Metal until it folded in 2000, and according to Jeff Wagner, in the late 1990s and early 2000s; a so-called “New Wave of Avant-Garde Metal” was spearheaded by The End Records. Wagner states that “with the support of [Misanthropy and The End Records] and other specialty labels, Metal’s new Avant-Garde had arrived.” Some other record labels which promote Avant-Garde Metal are Aurora Borealis, The Flenser, Holy Records, Hydra Head Records, Ipecac Recordings, Napalm Records, the Release Entertainment imprint of Relapse Records, Seventh Rule Recordings and Southern Lord Records. 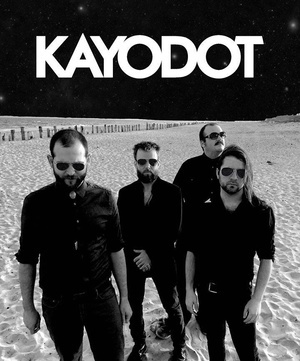 In the United States, local Avant-Garde Metal scenes have emerged in the San Francisco Bay Area with bands such as Giant Squid, Grayceon and Ludicra; in Boston, with bands such as Isis, Kayo Dot and maudlin of the Well; and in Seattle. According to the New York Times, some regional scenes that developed in the mid-1990s included the cities of Tokyo, Los Angeles and Oslo.